One Thousand, Nine Hundred, Ninety. Nineteen-Ninety-One. One-Nine-Nine-Five. Nineteen Hundred, Ninety-Six. 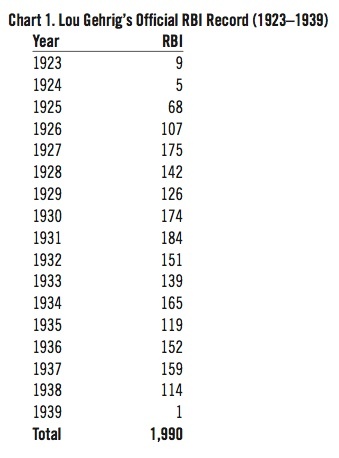 One can find all these different numbers for Lou Gehrig’s lifetime Runs Batted In (RBIs), depending where one looks. Which, if any, of those numbers—1,990, 1,991, 1,995, or 1,996—is correct? Unfortunately, as has been demonstrated innumerable times, there are errors in the official DBD records.2 So, it’s not inconceivable that Gehrig’s official RBI record could be compromised with errors—which, when discovered and corrected, could be responsible for the differing RBI totals given for Gehrig. Each of the numbers—1,990, 1,991, 1,995, and 1,996—appears as Gehrig’s lifetime RBI total in at least one edition of The Elias Book of Baseball Records, published annually since 1972 by the Elias Sports Bureau, the official statistician for Major League Baseball since 1987 (and for the National League since 1923). Significantly, every edition of The Elias Book of Baseball Records has been edited by longtime SABR member Seymour Siwoff. 1,991 RBIs. In the 1973 edition (page 25), Gehrig is listed as being the holder of the American League record for most lifetime RBIs with 1,991. The 1,991 lifetime RBI number for Gehrig is also listed in each annual edition of The Little Red Book of Baseball, 1940 through 1963. This publication, also put out by Elias, was the direct precursor of The Elias Book of Baseball Records and was edited by Siwoff 1953–1971. 1,990 RBIs. Beginning in 1974 and continuing through 1995, The Elias Book of Baseball Records lists Gehrig with 1,990 RBIs. 1,995 RBIs. Then from 1996 through 2006, Gehrig‘s total is listed as 1,995 RBIs. 1,996 RBIs. The Elias Book of Baseball Records from 2007 through 2011 gives Gehrig 1,996 RBIs. Thus it appears that Siwoff and his colleagues at Elias have discovered some RBI errors in the official records and made appropriate changes to Gehrig’s lifetime RBI number. Now, Gehrig’s lifetime RBIs should be equal to the sum of the RBIs he earned in each season, right? This raises the following question: for which individual seasons have RBI errors been discovered in Gehrig’s official DBD records? While The Elias Book of Baseball Records does not include season-by-season RBI statistics for individual players, it does contain a list of the players who led their league in RBIs for each season from 1920 forward. (1920 is the starting season because 1920 was the first year that RBIs were recorded on the official scoresheets; there are no official RBI records prior to 1920.) Since Gehrig led the AL in RBIs in five seasons (1927, 1928, 1930, 1931, and 1934), one can begin by checking the various editions of The Elias Book of Baseball Records to hunt for changes in Gehrig’s RBI numbers for those five years. In the 2007 edition of The Elias Book of Baseball Records, Gehrig becomes the sole AL leader for 1928 with 145 RBIs. Then, beginning with the 2008 edition, Gehrig gains one more, to be listed as the sole leader in RBIs for the AL in 1928 with 146. While Elias has presented four different values for Gehrig’s career total RBIs and three different figures for the 1928 campaign, they provide no explanation for the changes. Such information is exceedingly important to the research community, and its availability would allow others the opportunity to independently verify or refute the changes/corrections made by Elias. Taking into account only the information presented for Gehrig in The Elias Book of Baseball Records since 2008—1,996 career RBIs and 146 RBIs in the 1928 season—compared with his former totals of 1,990 and 142, this adds six RBIs to his career and four to his 1928 total. Therefore, Elias must have also found a net increase of two RBIs in Gehrig’s other major league seasons. The question is which? Since Seymour Siwoff is a good friend of mine, I asked him to provide this information. However, as is his right, Seymour chose to not provide me with any details of the changes Elias authorized in Gehrig’s RBI record.3 So, I had to come up with another way to ascertain the correct numbers for Gehrig’s RBI record. The most rigorous approach to ascertaining the correct value for Gehrig’s lifetime RBIs is to obtain the complete details for each run scored by the Yankees in all 2,164 games that Gehrig played. That’s a monumental task, but a doable task. And the task is made much more doable because over the past 40 years SABR members have already corrected some errors in the official DBD records, Gehrig’s included. For example, in the 1992 version of the Franklin Big League Baseball Encyclopedia (the baseball encyclopedia formatted in a “hand-held calculator”), Gehrig’s batting record shows 1,995 RBIs for his career—i.e., five RBIs more than that given in his official DBD records. Franklin shows Gehrig with 112 RBI for the 1926 campaign, five more than the official records. When one enters “PETE PALMER” in Franklin, the following text appears: “PETE PALMER PROVIDED THE DATABASE AND, WITH THE SABR, THE RESEARCH.” Pete Palmer, a longtime SABR member, credits Ray Gonzalez and Bob Davids, two of SABR’s founders, with contributing research to support the changes he made in Gehrig’s RBI record. The revised RBI information for Gehrig’s 1926 season (112 RBIs) and his career (1,995 RBIs) is also included in the third edition (1993) of Total Baseball edited by Palmer and fellow SABR member John Thorn. The first two editions of Total Baseball (published in 1989 and 1991) present 107 RBIs for Gehrig’s 1926 season and 1,990 RBIs for his career (the same values provided by Gehrig’s official DBD records). But the fourth through the eighth editions of Total Baseball (1995–2004) each list Gehrig with 112 RBIs in 1926 and 1,995 RBIs for his career. Several prominent baseball websites also present Gehrig’s career batting statistics. As of this writing (1 September 2011), each of these websites shows Gehrig with 1,995 RBIs for his ML career: SABR.org, Baseball-Reference.com, Retrosheet.org, Baseball-Almanac.com, MLB.com, Baseballhall.org. Proceeding to the game accounts provided in various relevant newspapers, I determined unequivocally the complete details for each run the Yankees scored in those three games. (See the Supplemental Material on the SABR website for all the details.) For the second game on 25 June 1926, from the account in the New York Times, it could be interpreted that Gehrig batted in two runs (not one run as given in the official DBD records). However, according to the more detailed accounts given in the Boston Globe and the New York World, it is unmistakable that Gehrig had just one RBI. Thus, the official record is correct for Gehrig having one RBI in the 25 June game. For the other two games, the newspaper accounts incontrovertibly show that Gehrig had four RBIs (not one) in the second game on 19 September 1926, and one RBI (not zero) in the first game on 25 September 1926. So at this point Gehrig actually had four more RBIs rather than five in those three games. From the game accounts in relevant newspapers, I determined unequivocally the complete details for each run the Yankees scored in those three games, corroborating the findings of Palmer, McCotter, and Carlson. Thus, Gehrig actually had one RBI (not two) in the second game on 25 September 1926, zero RBIs (not one) in the first game on 26 September 1926, and two RBIs (not one) in the second game on 26 September 1926. So, Gehrig actually had one fewer RBI in these three games than indicated in the official records. And based upon my examination of all six questioned games discussed so far, Gehrig has a net gain of three RBIs over the official DBD records. (c) the player who completed his at bat during the run-scoring event. So, overall for the 1926 season, there are nine games with errors in Lou Gehrig’s official RBI record. Lou Gehrig actually had 110 RBIs, not 107, a net increase of three RBIs. Let’s return now to the 1928 season—for which Siwoff lists Gehrig with 146 RBIs, four more than the official DBD records. The only other publication of which I’m aware that shows Gehrig with 146 RBIs in 1928 is the 2011 edition of the New York Yankees Media Guide; all of the other publications and websites mentioned have 142. Combs doubled. Warner threw out Meusel. Combs remained at second. Ruth tripled, scoring Combs. Tavener fumbled Gehrig’s grounder, Ruth scoring. Lazzeri hit into a double play, Gehringer to Tavener to McManus. First Inning: “Combs doubled to left centre to put the team in motion and, after Meusel had expired, scored on a triple by Ruth, who scored on a boot by Tavener. Seventh Inning: The Yanks pulled up close in the seventh when they knocked Van Gilder out and scored three runs on a pass to Ruth, a double by Gehrig and singles by Lazzeri, Koenig, and Robertson, the last a pinch hitter for Dugan. First Inning: Combs began by doubling off the scoreboard and after [third baseman] Warner had thrown out Meusel, Ruth’s triple to right counted Combs, and Ruth tallied while [shortstop] Tavener was fumbling Gehrig’s grounder. Seventh Inning: Ruth drew a pass at the start and Gehrig sent him hoofing it home with a double to left. Lazzeri’s single to left counted Gehrig. Koenig singled to left, putting Lazzeri on third. Holloway then replaced Vangilder and Robertson, batting for Dugan, singled Lazzeri in. From the above descriptions, it is unmistakable that Gehrig deserves credit for one RBI in his seventh-inning at bat—Gehrig’s double batted in Ruth who was on first base. But what about the first-inning run that Ruth scored—“while Tavener was fumbling Gehrig’s grounder”—does Gehrig deserve credit for batting in Ruth from third base? A pretty strong case can be made that Gehrig also deserves credit for one RBI in his first-inning at bat. Had Tavener fielded the ball and tossed it to first, Gehrig would have been retired for the second out; and Ruth, who was on third base, would have scored, with Gehrig receiving credit for batting in Ruth. The fact that Tavener fumbled Gehrig’s grounder, which allowed Gehrig to reach first base on the error, had no effect on whether or not Ruth scored—Ruth was going to score on Gehrig’s grounder to short, whether Tavener fielded it cleanly or not. 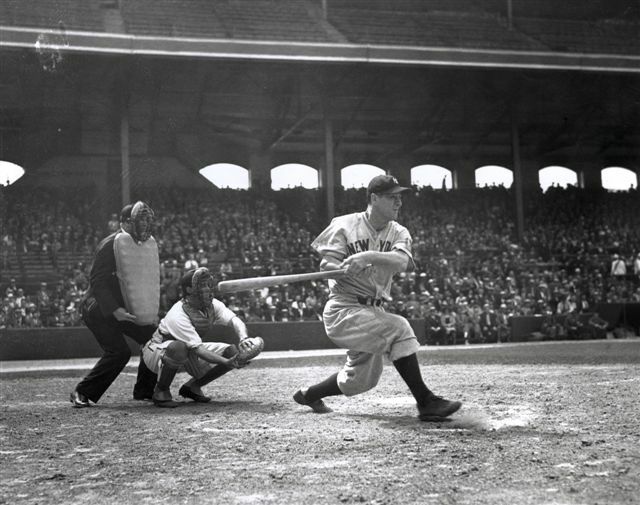 Accordingly, Gehrig should have received credit for batting in Ruth in the first inning—error or no error. That’s it. From 1920 through 1930, the entire scoring rule regarding runs batted in consisted of that nine-word directive. Since no official definition of a run batted in was given, each official scorer was essentially permitted to establish his own definition— which could change. Whether or not the Elias Sports Bureau decided that Gehrig should receive credit for batting in Ruth in the first inning of the second game of the doubleheader on 26 July 1928, is unknown (by me) at this time. But it certainly could have. I believe giving Gehrig credit for batting in Ruth in that first inning is the statistically-correct action to take. He would have received credit for that RBI according to the rules in effect explicitly since 1931, and perhaps implicitly before that. We must emphasize here that every edition of The Elias Book of Baseball Records shows Gehrig as the RBI leader for 1927 with 145 and 1930 with 175; neither figure is correct. However based on the data we do have (see Supplemental Material for details), it is appropriate to consider the RBIs credited to Gehrig in these three games in the official baseball records as being correct. Chart 3 provides a complete list of the 34 RBI errors discovered—and corrected—in Lou Gehrig’s official baseball record for the 1923–1930 seasons. Also provided is the relevant information for Gehrig’s teammates who have RBI errors directly connected with Gehrig’s RBI errors. 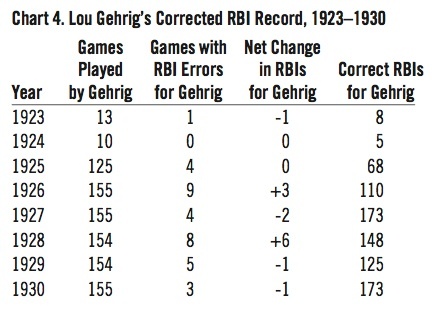 the implementation of the corrections in Gehrig’s RBI record. According to my research, as indicated in Chart 3, there are 34 games in which the official baseball records have erroneous RBI statistics for Lou Gehrig during the first eight years of his major league career (1923–1930). For five of these games (Lines 10–14), Pete Palmer, Trent McCotter, and Keith Carlson discovered—and corrected—the RBI errors. I have independently corroborated each of those errors and their corrections. The supporting documentation for the corrections of each of the 34 RBI errors is provided in the Supplemental Material, which is available on the SABR website. Also provided for each RBI-error game are newspaper box scores RBIs for Gehrig (although it is pointed out that newspaper box scores did not include RBIs before 1928). The most important aspect regarding the information presented in Chart 3 concerns the reliability of the information. Are the official RBI numbers alleged to be wrong truly wrong and are the “actual” RBI figures claimed to be correct truly correct? Readers are encouraged to examine the supporting documentation and make their own conclusions for each of the 34 RBI errors described here. 15 games where “two-player” mistakes like the Shawkey-Gehrig mix-up shown on Line 1 of Chart 3 were made. Two games (20, 29) where the number of RBIs in the official records exceed the number of runs scored. Two games (19, 26) in which no Yankees players were credited with any RBIs in the official records—even though the team scored 10 runs and 7 runs, respectively. Four games with RBI errors (11–14) resulting from the official scorer mistakenly entering “earned runs scored” instead of “runs batted in” in the RBI column of the official scorer’s report. Seven games (3, 4, 8, 25, 28, 31, 33) where the RBI errors—and their corrections—are clear-cut based on the supporting documentation. The RBI errors in these games include mistakes of crediting Gehrig with an RBI for stealing home and not crediting him with an RBI for a bases-loaded walk. Line 2. With Combs on third and Meusel on first, with nobody out, as stated in the Boston Globe account, “Gehrig sent an easy bounder to [shortstop] Gross, who threw to [second baseman] Rogell in an attempt to force out Meusel. Rogell dropped the ball, Meusel being safe, while Combs scored.” Even if Rogell had not dropped the ball (and even if Rogell had then relayed to first to also retire Gehrig), Combs would have scored. Combs would have scored, error or no error—the official scorer simply made an error in not crediting Gehrig with an RBI. Line 22. In the first inning, with Ruth on third, with one out, as stated in the Detroit Times account, “Ruth tallied while [shortstop] Tavener was fumbling Gehrig’s grounder.” Had Tavener not fumbled the ball and thrown to first to retire Gehrig, Ruth would have scored anyway, so Gehrig deserves credit for batting in Ruth. Gehrig also batted in Ruth (from first) in the seventh inning (with nobody out) with a double. For the game, Gehrig deserves credit for two RBIs. Line 23. With Paschal on third, Combs on second, and Ruth on first, with one out, as stated in the Chicago Tribune account, “Gehrig sent a hot grounder to [first baseman] Clancy. Paschal scored when Bud threw to [shortstop] Cissell to force Ruth. Perhaps Cissell shouldn’t have tried for a double play, but he did. No one was covering first, so Bill got an error, Combs scored and Gehrig went to second.” Paschal scored on the force-out that Gehrig hit into. Had the double play been executed, Paschal’s run would not have counted. But, since the error was made by the shortstop, not the first baseman, the double play was pre-empted. Thus, Gehrig deserves credit for batting in Paschal. Line 30. With Combs on third and Robertson on first, with nobody out, as stated in the Washington Post account, “Gehrig hit [pitcher] Marberry in his midriff with a smashing drive which the pitcher pluckily fielded. He got Robertson at second, but Combs scored.” This was a simple fielder’s choice force-out—Gehrig deserves credit for batting in Combs. Chart 4 presents the net effect of correcting the RBI errors in Lou Gehrig’s official records for each individual season during the 1923–1930 period. Except for 1924, errors were discovered in each season during the 1923–1930 period, though those in 1925 resulted in no net change. Six of Gehrig’s season totals are different from what is given in the official baseball records. Of particular note are three seasons where he led the American League: 1927, 1928, and 1930. Effecting the corrections of the errors in Gehrig’s official RBI record for the 1923–1930 period results in his career-to-date RBI total being 810 RBIs—i.e., four RBIs more than the 806 RBIs calculated from the official baseball records. The final topic of discussion concerns the implementation of the RBI information for Lou Gehrig described in this article: who is going to use it or where else will it appear? Since Palmer’s database of baseball statistics is contractually used by several websites, including Baseball-Reference.com, Retrosheet.org, and SABR.org (including the SABR Encyclopedia), implementation of these corrections would be broad-based and far-reaching. Likewise, Retrosheet’s database of game box scores and each player’s daily statistical record is a vital database for baseball researchers and the changes would be far-reaching. Tom Ruane of Retrosheet did review this paper prior to publication and concurred with all but one of the corrections recommended: No. 22, the second game of 26 July 1928. Tom wrote: “I don’t think that there is enough evidence to give Gehrig an RBI on his ground-out in the first inning. It would all depend upon the positioning of the shortstop. If he was playing in and, in the opinion of the official scorer, would have been able to throw Ruth out at home had the ball been handled cleanly, an RBI would not be granted. In general, I think we have to give the benefit of the doubt to the official scorer in this case, despite the fact that it appears he made two other clear mistakes (giving both Combs and Robertson an extra RBI) in the game.”14 It seems likely Retrosheet will adopt the other changes. When it comes to the STATS database, the authority is Don Zminda, a longtime SABR member and Vice President and Director of Research for STATS. He explained, “We [STATS] have contractual relationships with some major media clients, and those clients expect us to match the official numbers reported by MLB.”15 Those numbers are currently compiled by the Elias Sports Bureau. Will Steve Hirdt and Seymour Siwoff deem the evidence presented here for the errors—and corrections— in Gehrig’s official RBI record to be at least “clear and convincing?“ We’ll find out. What is known for certain is the RBI information presented here for Gehrig’s 1927, 1928, and 1930 seasons is at odds with the most recent editions of The Elias Book of Baseball Records. Thus, it will be particularly interesting to see if Siwoff incorporates any of the corrections/changes claimed here—especially for Gehrig’s AL-leading RBI totals in the 1927, 1928, and 1930 seasons. And what will be shown for Gehrig’s lifetime RBI total—1,990 or 1,991 or 1,995 or 1,996 or ...? Finally, what will Major League Baseball do with/about the RBI information presented in this article? We’ll see; the final draft of this manuscript and Supplemental Material was provided to John Thorn, who was appointed Official Historian of Major League Baseball on 1 March 2011 by Commissioner Bud Selig. To wrap up this article I want to emphasize the sub-title—“Striving To Get It Right, Thanks to 40 Years of Research by SABR Members.” We’re not there yet—but we’re getting closer. We’ve discovered—and corrected— 34 errors in the official RBI record of Lou Gehrig for the first half of his career (1923–1930). And we’ve started the research on the remainder of his career (through the 1939 campaign). We plan to complete the requisite research before Opening Day 2012. It is with tremendous pleasure that I thank the following people (most of whom are SABR members) for their outstanding assistance in helping me assemble the information presented in this article: Freddy Berowski, Cliff Blau, Steve Boren, Rich Bowering, Keith Carlson, Bill Deane, Steve Elsberry, Mike Lynch, Bob McConnell, Trent McCotter, Andy McCue, Marilyn Miller, Rod Nelson, Bill Nowlin, Pete Palmer, Tom Ruane, Dave Smith, Mitch Soivenski, Gary Stone, Jerry Wachs, Tim Wiles, and Robert Zwissig. I should also like to express my gratitude to Seymour Siwoff for continuing to put out The Elias Book of Baseball Records (especially after The Sporting News ceased publication of its Baseball Record Book). 1. The 1,990 RBI total does not include the 35 RBIs Gehrig picked up in World Series games or the five RBIs he got in All-Star games. 2. See for example: (a) Herm Krabbenhoft, “The Authorized Correction of Errors in Runs Scored in the Official Records (1945-2008) for Detroit Tigers Players,” The Baseball Research Journal 37 (2008): 115; (b) Herm Krabbenhoft, “The Authorized Correction of Errors in Runs Scored in the Official Records (1920-1944) for Detroit Tigers Players,” The Baseball Research Journal 40 (Spring 2011): 66; (c) Trent McCotter, “Record RBI Streak Discovered: Hall of Famer Tris Speaker Put Together a String of 14 Consecutive Games with an RBI in 1928 That Was Unrecognized for 79 Years,” Baseball Digest (May 2008): 62; (d) Trent McCotter, “Hitting a Home Run and Not Being Credited with an RBI,” newsletters of the SABR Baseball Records Committee (August 2008): 2 and (October 2008): 2; (e) Tom Ruane, “Missing RBI,” SABR_Records@yahoogroups.com (August 22, 2010); (f) Tom Ruane, “More on Missing RBI,” SABR_Records@yahoogroups.com (September 2, 2010); low-RBI games; (g) Herm Krabbenhoft, “The Correction of Errors in RBI in the Official Records (1931– 2011) for Detroit Tigers Players,” manuscript in preparation; (h) Cliff Kachline, “ Hack Wilson’s 191st RBI: A Persistent Itch Finally Scratched,” The Baseball Research Journal (2001):76. 3. Seymour Siwoff, personal communication via telephone conversations, 21 April 2011 and 27 April 2011, and email correspondence, 22 April 2011 and 29 April 2011. 4. Pete Palmer, personal communication via email correspondence, 4 April 2011. 6. 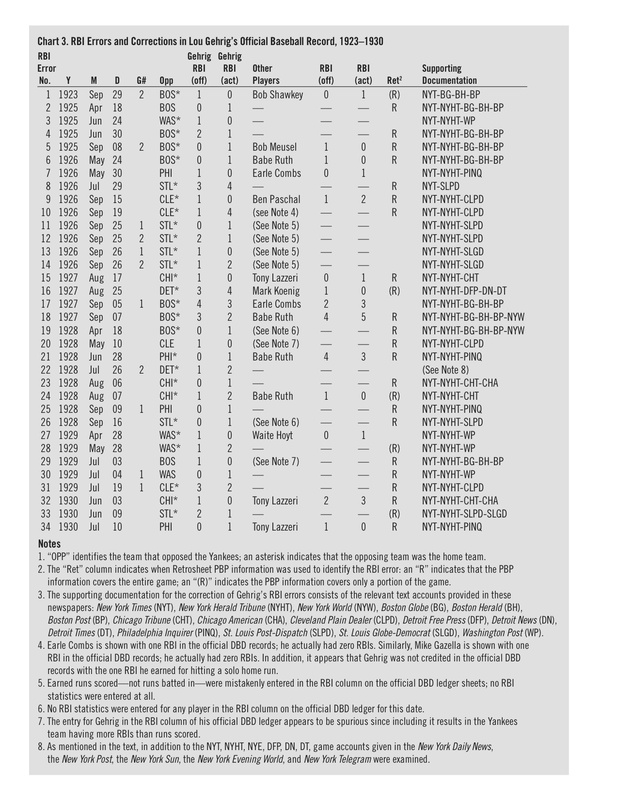 Trent McCotter, “Tweaking The Babe’s Numbers,” newsletter of the SABR Baseball Records Committee (February 2005): 1. 7. Trent McCotter, personal communication via email correspondence, 25 January 2011 and 24 April 2011; Pete Palmer, personal communication via email correspondence, 24 April 2011. 8. Dave Smith, personal communication via email correspondence, between 1 May 2011 and 31 July 2011. 9. This task was facilitated greatly by the superbly generous cooperation of several SABR members who provided photocopies or scans of the game accounts presented in newspapers to which they had access—Cliff Blau, Steve Boren, Rich Bowering, Keith Carlson, Mike Lynch, Marilyn Miller, and Bill Nowlin. 11. The RBI error for Gehrig in the game on 16 September 1928 was discovered by Trent McCotter. See reference 2(d). 13. Herm Krabbenhoft and Trent McCotter, “Most Runs Batted In: Individual Player …Single Season…American League,” presentation at SABR 41 (July 2011, Long Beach, CA). 14. Tom Ruane, personal communication via email correspondence, 1 September 2011 and 2 September 2011. 15. Don Zminda, personal communication via email correspondence, 28 August 2011. 16. Steve Hirdt, personal communication via email correspondence, 5 July 2011. 17. Steve Hirdt, quoted by R. Chamberlain in “SABR Nine Questions,” The SABR Bulletin, July-August 2006: 6.